Peep all the fashionable people that turned out for the opener of the 2012 Lagos Fashion and Design Week. This week J.C. Penney announced that Duro Olowu, Nigerian-born designer based in London, would be its first “seasonal designer,” releasing a limited-edition collection for spring 2013. Set to retail from $10-$100 Duro administers his vibrant prints touch to the collaboration and gives his fans who want a Duro Olowu but for less to cop. If you spend lots of money buying the finest and most expensive makeup and you don’t have the right tools, then I’m afraid you won’t be getting the best use out of your money. With the right tools, you are well on your way to achieving flawless and professional looking makeup. However, there are dozens of makeup brushes out there and it can be quite a chore knowing which ones are the best and what they do. Hopefully at the end of thisarticle class, you should be able to pass any Brushology exam with flying colours. For clarity, I will be broadly categorizing makeup brushes into: Face, Eyes and Lips. Foundation Brush: Most foundation brushes are flat, with a pointed end. This helps you apply your foundation smoothly and evenly. The pointed end helps you get to hard-to-reach corners of your face like around the nose and under your eyes. In more recent times, people have moved away from traditional foundation brushes to buffing/stippling brushes for applying their foundation. These brushes are densely packed with a flat rounded top which gives your foundation an airbrushed finish because you are able to work the product into your skin. 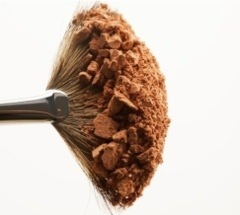 Powder Brush: The little puffs that come in most powder compacts have a way of transferring too much product to the face, making one look cakey. A fluffy powder brush, preferably made of natural fibre, will help you apply powder sparingly to specific parts of your face like your t-zone and your chin. Blush Brush: It is possible to use your powder brush to apply your blush if it is made for both purposes like MAC’s 129 brush. However for a more precise application, you need a blush brush. Most blush brushes are small and dome-shaped, allowing you to apply product directly on the apples of your cheeks. Concealer Brush: These brushes are shaped like foundation brushes but are much smaller. Their size and shape makes it easier to dab concealer to under eye circles, around the nose and on blemishes. I personally prefer to apply concealer on blemishes and dark circles with my fingers because the warmth of my fingers helps blend the product into my skin. Synthetic brushes are best for liquid makeup like concealer because they don’t pick up too much product. Contour Brush: This brush is not essential, but if you like to contour your face to make it appear slimmer and more chiseled then you would require one. Most contour brushes are angled to fit perfectly in your cheekbones. Kabuki Brush: Another brush that isn’t totally essential but has its advantages. A Kabuki is a powder brush with bristles that are more densely packed to help you achieve more coverage with your powder without appearing cakey. They are usually made with natural fibre and are very handy to carry around. I always chuck those eyeshadow applicators that come in eyeshadow palettes as I don’t think they are ideal for applying eyeshadow. Flat Shader Brush: This brush is usually stiff and square shaped so it picks up color well. It is handy for applying eyeshadow to the lid of your eye. Used in patting motions, it allows even distribution of product on the lid with very minimal fall out. Blending Brush: This soft, tapered brush is used to apply a transition color in the crease to soften the look of your eyeshadow. To create a smokey eye, a stiff blending brush helps to precisely apply and blend darker shadows in the crease. Pencil Brush: Not entirely necessary unless you like to apply eyeshadow in your inner tear duct area or want to create a more defined crease. You can also use it to apply eyeshadow to your lower lash line. Angled Brow Brush: If you use a brow powder or eyeshadow to fill in your eyebrows then you will need a good brow brush that is angled and thin for precise application. Eyeliner Brush: Ideal for applying gel eyeliners. The best ones are usually angled for easier application. Lip brushes are not very popular because honestly, it is much easier to apply your lipstick straight from the tube. However, if you want to get a precisely defined lip especially with bright colored lipsticks, then you would need a small one with firm bristles and a tapered head. This Brushology class would not be complete without mentioning anything about brush care. It is essential to keep your brushes clean to prevent build up and transfer of bacteria to the skin which causes acne. Wash them every two weeks with baby shampoo to keep them fresh and lasting longer. Fashion fabulousity is definitely rocking the city of Lagos this week. We are super excited that the 2012 edition of the MTN Lagos Fashion and Design Week has officially kicked off. This edition will see lots of top Nigerian and African design labels including Iconic Invanity, showcase its latest collections. The luxury design label is a lifestyle brand defined by a vast heritage of the African culture and an infusion of western retro inspired aesthetics. For the label’s Spring/Summer 2013 collection, the creative director,Nancy Nwadire is sending us all to the dentist’s with the presentation of the “Luxury Sweet Candy”Collection. The collection is full of vibrant candy store colors like sorbets and sherbet palettes. Heavily embellished bead works adorn the pieces and represents items like candy floss, lollypops and éclairs. Taking a contemporary take on classic glamour, each piece of this collection tells a unique story that stays within the “Luxury Sweet Candy” theme. You’re Invited to the Official Opening of London Shirt Store, Grosvenor in Nigeria – Thursday 1st November 201. You wouldn’t go months without scrubbing your bathroom, or eat food that’s been sitting around long past its expiration date, so why doesn’t your makeup bag get the same respect? If you haven’t washed your brushes since—um—never, and your favorite pot of gloss is looking more and more like a petri dish, check out this guide to getting a fresh start. Change your mascara every three months like clockwork, and don’t try to cheat: bacteria can cause redness, irritation, and very unglamorous pink eye.The best way to know when it’s time: “When you take the wand out and it doesn’t make a ‘pop’ from suction,” says Martin. Shadow, blush, and any other dry products should be thrown away every 12 months. Replace your foundation after six to eight months to keep bacteria from growing in the wet environment, and even sooner if the smell changes. Liners, lipsticks and glosses have a shelf-life of 12-18 months, but get rid of them if the texture starts to change.